The day after Jess’ family left, we were eager to get out and go hiking despite the rainy forecast, so we drove up to the Kahana Valley on the Windward side to go for a loop hike in Ahupua’a ‘O Kahana State Park. Rain had been predicted the entire week that family was here, but the weather turned out perfect; unfortunately that wasn’t the case today. We brought our umbrellas and went out anticipating a wet hike. It was drizzling the whole drive there and started raining harder once we reached the trail junction for the loop hike. Seeing that there were 4 river crossings and hearing from others that the water was rushing pretty high, we opted to skip the muddy and potentially dangerous trail and walked up the paved reservoir road instead. There weren’t any views, but we still had a pleasant 3 mile walk in the rain. The week following, Jess came down with a mainland virus that family brought with them. As such the week was slow, mostly spent getting better and working. When Saturday rolled around with more rain, we took it as an opportunity to relax and recuperate. 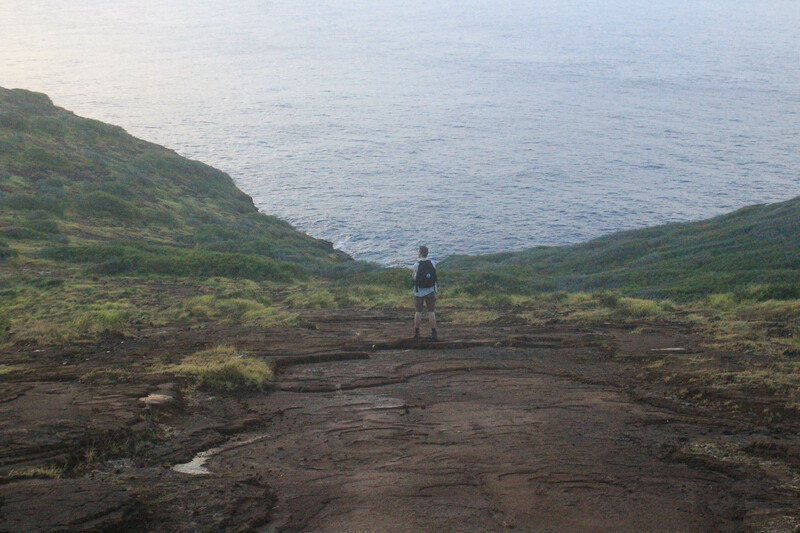 But by the evening, Jess felt well enough to go on a hike and the weather for the morning looked pleasant, so we made plans for a sunrise hike of Koko Head. 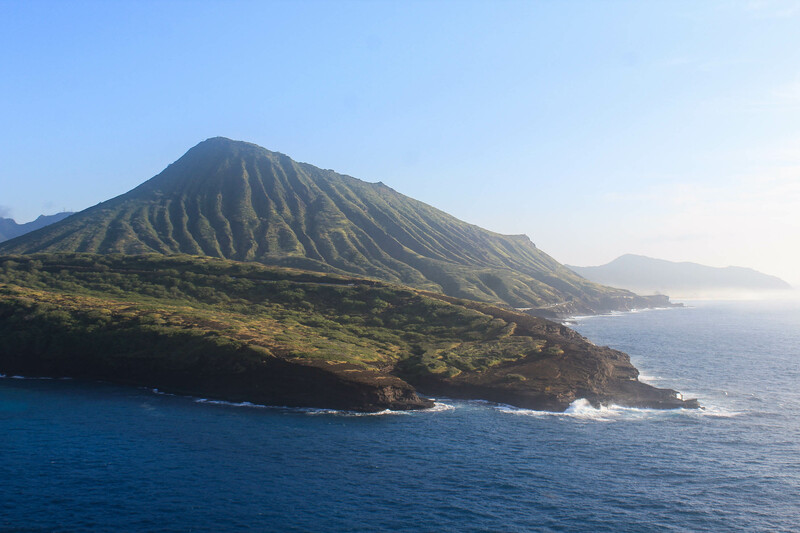 We had previously done Koko Crater, the more impressive and younger volcanic vent just to the North, and knew how popular that trail can get during the day. 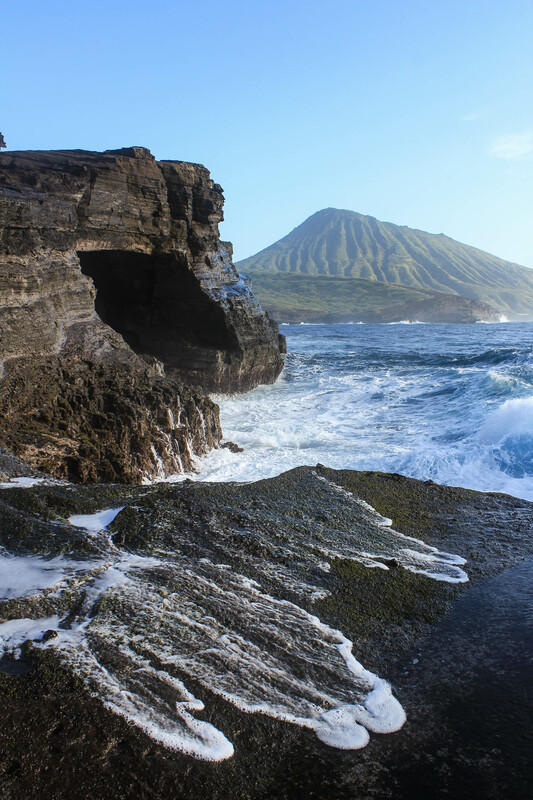 Koko Head would probably be less popular, but we weren’t taking any chances. 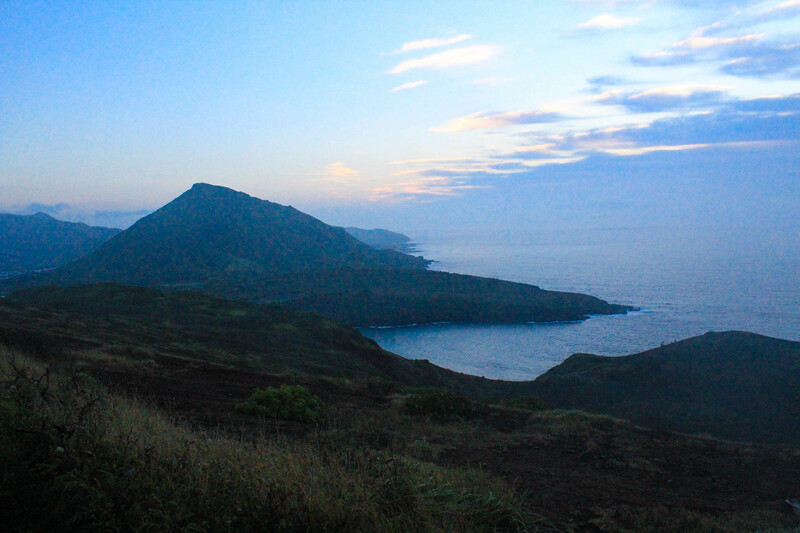 We parked in the lot for Koko Crater where there were already early risers climbing the steps. We proceeded the opposite direction following an old access road…with a surprising number of cats; 17+ in all. We crossed Highway 72 and started following the access road to the peak of Koko Head. This road, giving access to communications towers on the summit, is technically closed to the public, but is commonly used by hikers with no known enforcement. We made the summit as the sun started to rise over Makapu’u running into only two other hikers. We stopped briefly on the summit to admire the views of Makapu’u, Diamond Head, and the Ko’olau Mountains, and look for geocaches (the boxing here is quite limited so I take what I can get). We then began our trek down along the crater rim. The hike down was steep over smooth lava flow and the crater below was filled with the morning mist. We made a brief foray down a gully towards the ocean and watched the waves crash against the sea cliffs. We retraced our steps, regained the main trail and walked across the bottom of the crater before walking up the other side. Doing this hike at sunrise proved to be beneficial as there was very little shade on the trail. Once on the other side of the crater, we had uninterrupted views of Hanauma Bay. Somehow, someone got their truck out there as well and was fishing along the Southern coast. We spotted a kayaker out in the ocean, floating among the big waves. We continued around the crater going back down by the sea again to a sea cave. We happened to be at low tide so we were able to walk out onto an exposed rock and watched the waves come crashing up into the sea walls. The hike then led along the edge of Hanauma Bay which was already beginning to fill up with beach bums and snorkelers. The trail then got very steep again as it climbed back up to the road. We ran into a couple dozen more hikers on the way down to the car. Altogether the hike was 4.5 miles and we spent about 2.5 hours hiking and enjoying the beauty of the South shore. Afterwards we enjoyed some malasadas from a very strategically placed Leonard’s Bakery food truck.